Common testing techniques for determining if a gold or silver coin is genuine or fake includes weighing, size measurements, close visual inspection, and destructive tests such as acids. But some of the better fakes pass both weighing and size measurement tests. Some time ago, I came up with an idea for a new additonal method of testing gold and silver coins. The resonance frequencies of an object are determined by the objects shape and material. So, why not analyze the resonance frequencies of a coin to determine if it really is made of silver or gold? This is actually not a new idea. The method is commonly called a "ring test", where you tap a coin and listens if it sounds right. But determining if it sounds right or not can be quite difficult. So I thought this testing method could be improved upon. And now I am finally done: An Android App which records the resonance frequencies of a coin, and compares them to the resonance frequencies are of genuine coin. 1. Cheap and easy to use. 2. Silver or gold plating make little effect on the resonance frequencies of a fake coin. 4. Requires no equipment besides a smartphone, which means the test can be done anywhere, any time. 5. It is a new weapon in the arsenal to use against the ever improving fakes flowing out on the market. 6. The test even analyzes resonance frequencies outside the range of human hearing. 7. Unlike manual ring-tests, this app works even if you are tone deaf. 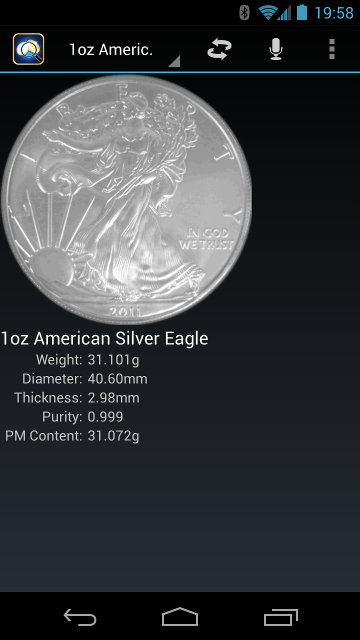 The app is called "Bullion Test Free", and can be downloaded from Google Play. When the app starts, you can select a coin from a drop-down menu. Right now only three types of coins are supported. More will be added soon. There is a button to flip the image of the coin, and some technical information about the coin. The image is supposed to be in 1:1 scale, so you can use it to do a coarse comparison of the diameter by placing your coin on the screen and see if they are equal in size. However, not all Android devices support 1:1 natural scale, so there can be some variations. In order to perform a resonance test, click on the microphone icon. A diagram is shown, with blue lines indicating the expected resonance frequencies of the selected coin. The test is sound activated. Balance the coin on your fingertip near the microphone of your smartphone. Tap the edge of the coin using your fingernail or some hard object. Do NOT use a second coin to hit the first coin, as the sound from the second coin can affect the test. The required sound level depends on the sensitivity of your microphone. For most android devices it is sufficient to gently tap the coin using your fingernail, but some devices with less sensitive microphones (including some tablets) require that you tap the coin with a harder object, such as a pen or the handle of a screwdriver. Be careful not to damage your coin. To redo the test, simply tap the coin again. It may take some practice to produce clean enough sounds from the coin. The app filters out background noise reasonably well, but I recommend that you do the test in a silent environment. Especially high-pitch noises from electronic equipment may affect your results. I do not in any way guarantee any level of accuracy of this app. You should only use this test as a complement to other tests. 1. It is technically possible to create a fake coin with the same resonance frequencies as a genuine coin. But it is more difficult to create an alloy which mimics both the density and resonance frequencies of silver or gold. Combine multiple test methods to increase the chance of detecting a fake. 2. There are variations in the audio hardware of different Android devices. 3. You must produce a clean 'ring' from the coin. It may take a few tries to get it right. 1. There are no official specifications of what the resonance frequencies of genuine coins are. This app is based on empiric tests of known good coins. Some variations are to be expected even in genuine coins. 2. 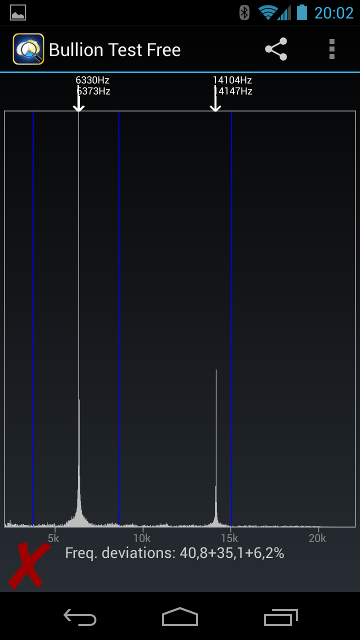 Many resonance frequencies examined by this app are above 10kHz, some are even outside the range of human hearing. 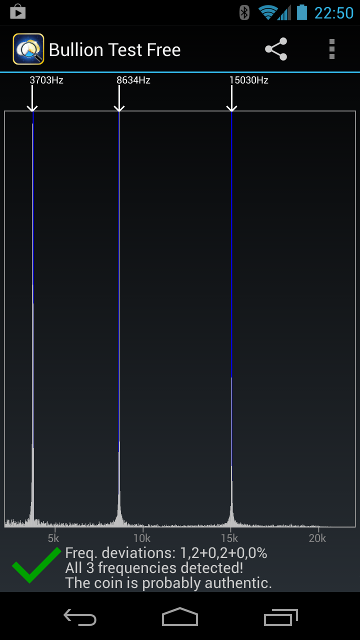 Not all Android devices are capable of recording such high frequencies. Feel free to contact me using the e-mail below.